Here's the setting for this dish: I was 19 and it was one of my first dates. I was very nervous, as I'm sure many people have experienced. I'd lied to my parents about where I was going that night (I wasn't "out" to them yet). The guy I was with was cute and had seemed nice. Although we had a fun time, he didn't want to have anything to do with me afterwards (unfortunately, something else I'm sure many of us have experienced). Nonetheless, I consider my first date a success not because of the guy, but because it introduced me to this dish. I was dining at Bastas, an Italian restaurant in Portland, Oregon, that was just 4 years old at the time, but is still around today. The dish I enjoyed was "Pasta Pollo con Salvia." Although it is no longer on the menu, a Facebook post suggests they offer it as a special sometimes. 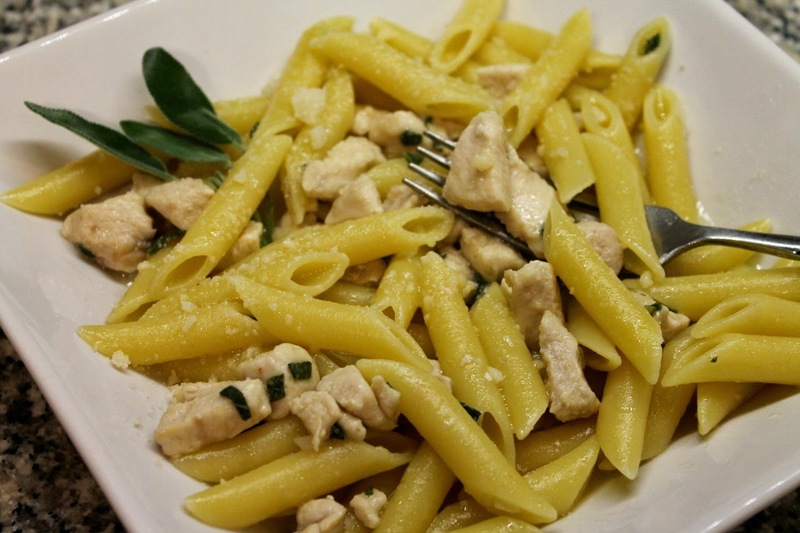 It's a simple dish of penne, chicken breast, garlic, white wine and sage. At the time, I thought it was novel for not including tomatoes, and I loved how garlicky it was (in retrospect, I suppose not a good choice for a date, but remember, I was a dating novice). For years, I tried to recreate it. I contacted the restaurant to ask for the recipe, but they declined my request (or rather, never responded). This just gave me all the more incentive to figure out what made the dish special on my own. Through the years, I've made many different versions of this dish. The sauce has been a particular challenge. I've tried making it with butter, cream, chicken stock, various dry white wines and combinations of those three things. I've tried thickening it with flour and arrowroot powder. I've made it in a great volume as well as a light coating. Recently, I finally hit on what I think works best: a simple combination of butter, dry vermouth and pasta cooking water. The cream made the dish too rich. The chicken stock muted the garlic and made it too "chickeny." The butter and pasta water allowed the garlic to really shine, while the starches in the water added a touch of thickening. Perfect. 1. Cook pasta according to package directions 2 minutes short of al dente. Reserve 3/4 cup pasta water. Drain pasta and set aside in the cooking pot. 2. Melt butter in a medium (2 1/2 quart) saucepan over medium-low heat. Add garlic and chili pepper flakes and cook until garlic is fragrant. Increase heat to medium and add chicken. 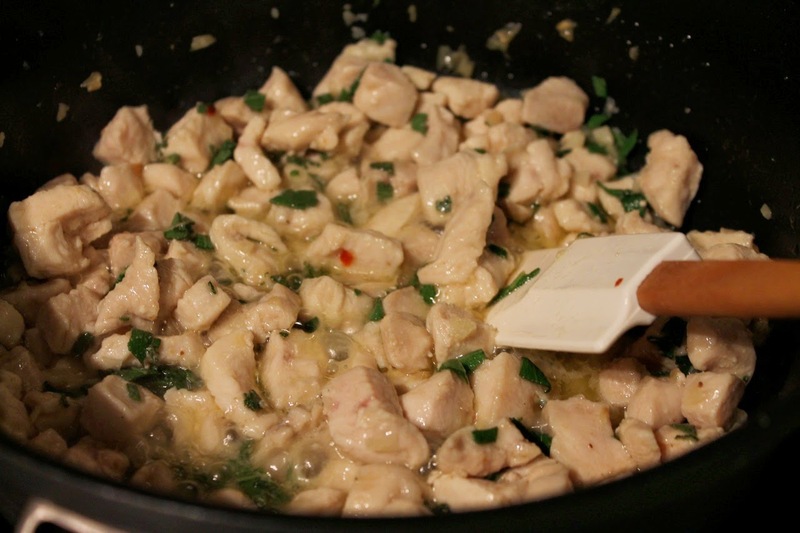 Season with salt and pepper and cook, stirring occasionally, until the chicken is no longer pink, about 8 to 10 minutes. Stir in the sage and vermouth and increase heat to medium-high. Cook for about 2 minutes then add the reserved pasta water. Bring mixture to a boil and cook an additional 2 minutes. 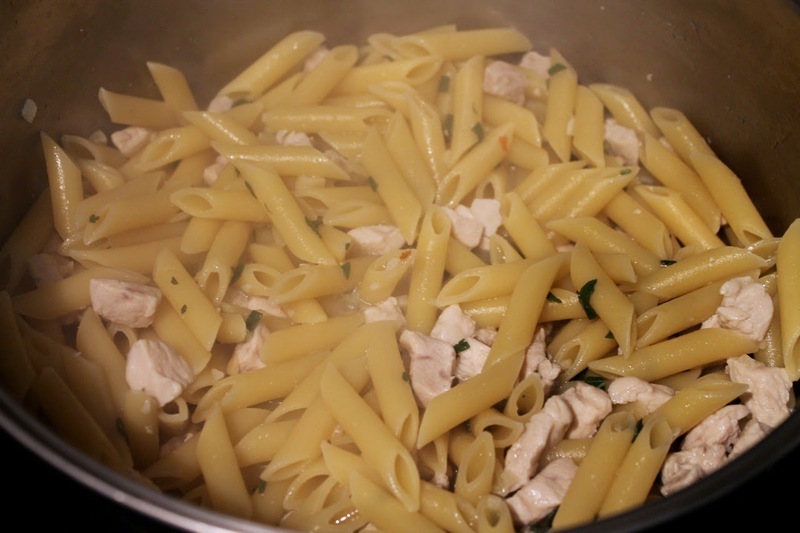 Pour sauce over the cooked pasta in the pasta cooking pot and stir to combine. Return to medium heat and stir in the parmesan. Cook for another 2 minutes until the pasta is al dente. Serve in shallow bowls topped with additional grated parmigiano-reggiano cheese. I consider this your classic dish. We've been enjoying it for years, and I must say I've appreciated all the variations. And no one is happier than me to learn your date all those years ago was a bust. Thank you for letting me know! I edited the instructions. The sage goes in with the vermouth after the chicken is cooked. What a coincidence! I too remember this dish from the restaurant in Portland Oregon and just tried to google it. I feel almost positive that it was published in the Restaurant Request section of The Oregonian's FoodDay sometime in 1994 or 1995. I remember wanting to cut it out, but accidentally recycling the paper instead. I don't think the Restaurant Request section from such a long time ago was ever put online. I look forward to trying your version! That's really good to know! I'll have to look into it. I bet libraries in Oregon would have it.